Joyful tidings are pouring out all the way from Sydney as the Men in Blue continue to remain rampant whilst making their giant strides towards a first-ever series win Down Under. 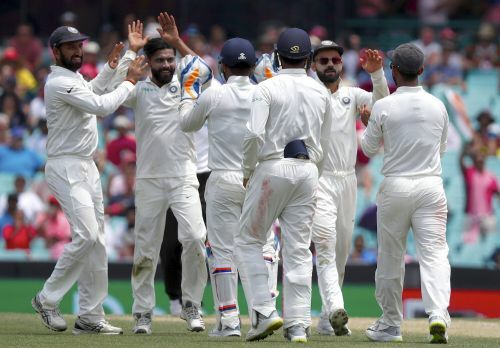 Having declared their first innings at 622/7 yesterday and keeping the Australians stranded in a sea of questions at 24/0 while batting second, India resumed their efforts with the ball earlier today. They had to wait for 12 overs for the first break to come through as Usman Khawaja, who was finding it difficult to read Kuldeep Yadav, found Cheteshwar Pujara at mid-wicket while trying to attack the young chinaman to release some pressure. They had to wait for another twenty-odd overs to get the next breakthrough, but afterward, wickets kept falling at regular intervals, much to the hosts' chagrin. A smattering of rain eventually stopped the proceedings of the day prematurely, as umpires called Stumps with more than 16 overs of legitimate play remaining. Australia is now at 236/6, with 187 more runs still required to avoid a follow-on. Even if that target is crossed, it will by no means guarantee a result in favor of Australia, as their fate is very much packed and sealed. 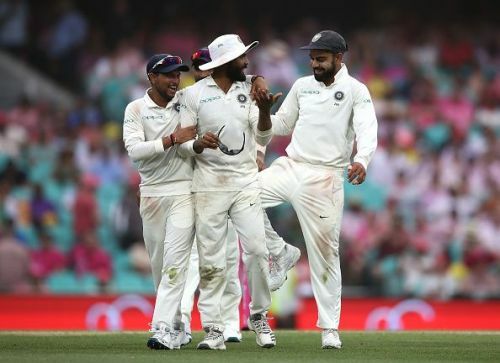 In what appears to be not just a talking point from a single day's game in a single Test match, the Indian bowlers have been plying their trade with great discipline throughout the series. Not only have they outclassed the Australian bowlers in their own backyard, but they have also given the Indian fans something more to be hopeful of in the coming years. The pacers and the spinners alike did their work with the help of an impressive awareness about the pitches on offer. They bowled in the right areas and forced the Aussie batsmen to make errors in judgment on many occasions. In today's game as well, for instance, Kuldeep initiated the advance by forcing Khawaja to attack him, the latter eventually holing out to Pujara at mid-wicket. This was followed by Jadeja taking Harris' bails by inducing him to push the ball from wide of off-stump. The ball simply moved inwards, caught his bat's inside-edge and clattered into the stumps. Kuldeep and Jadeja continued to break down their hosts' batting lineup, eventually accounting for five of the six wickets that fell today. The pacers, on their part, bowled in tandem with the spinners and didn't allow any batsman to settle and look good to take the game away. The pitch was supposed to help the turning ball from Day 3, and that was exactly what happened. The Indians on their part, mainly the spinners, just bowled according to the conditions available, and they reaped their results.